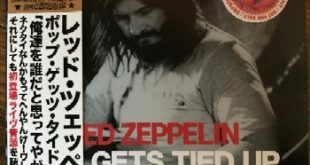 Led Zeppelin’s first European tour took place in late February to mid March 1970 and consisted of 12 dates in eight countries, recordings exist for seven of the shows and like the short UK tour at the beginning of the year, would see songs from the second album be firmly in the set as would a new piece, Since I’ve Been Loving You. There are several really great shows, Copenhagen February 28, Montreux March 7, and the two Hamburg dates March 10 & 11 should be considered essential listening. The first date in Helsinki is quite good, I have not listened to it for years and in readying for this review, pulled out my old Valhalla I Am Coming (Mandala Records MA2112-1-2) and was quite surprised that even through the thick layer of hiss, is really enjoyable. Vienna March 9 is rather dull, leaving us the final concert in Dusseldorf, the subject of this title from the No Label folks. 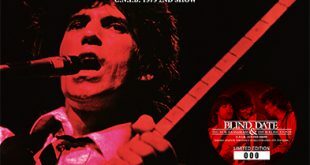 There are four recordings from this concert in varying degrees of completeness, source one is a three song fragment consisting of White Summer, Since I’ve Been Loving You and Dazed and Confused and was released on Bring It On Home (POT 008/009). Source two is a another fragment, this one covering How Many More Times, and has been found on Psychedelic Raw Blues (Immigrant IM 017-018), source three, while fragmentary features a 65 minute chunk of the concert and has been released on Loreley (Moonraker MRCD-005/006). The fourth source appeared in 2004 and was near complete and like the other three falls into the good to very good range. The first label to release it was Reel Masters as Dusseldorf 1970 (Reel Masters TSTC404078/79), the label used some heavy handed mastering that left the sound plagued with that metallic noise. This was rectified on Dusseldorf Raw Master (Wardour-013 A/B) which featured the complete tape in great quality. 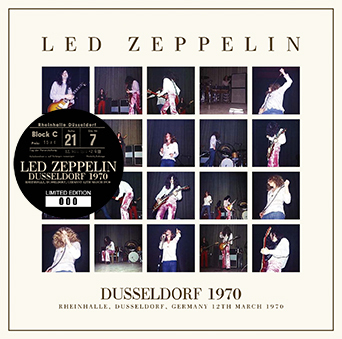 This new title, Dusseldorf 1970 from No Label features source four with both source 1 and source 2 to fill in a few gaps providing the most complete version of the concert to date. When compared to the Wardour title, this new No Label is louder and clearer with better frequencies and dynamics, the level of hiss is similar between the two and I consider this to be a nice upgrade. The sound falls into the good to very good range, there are several mic bumps in the first disc, the taper was surly trying to find the best position for his equipment. There is some distortion as one would expect, the bass is nicely in the mix and all instruments and Plant’s vocals are easily discernible. The cuts I detected are during White Summer / Black Mountain Side at 6:51 to 6:56 that is patched with source 1 and source 2 is used for a cut at 15:19 to 17:30 in How Many More Times. The patches are seamless and very well handled. 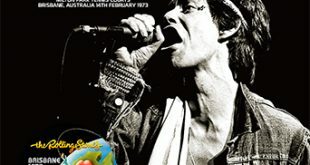 The performance on the whole is very good but a bit uneven, the band cast aside the opening song We’re Gonna Groove in favor of Communication Breakdown that sounds completely improvised by Page. Plant tells the crowd to loosen up and move about after I Can’t Quit You only to tell them to chill out after Heartbreaker, careful what you ask for! Dazed and Confused is good but not killer, although the audience cheer for Jimmy after his bow solo. White Summer / Black Mountain Side is a monster, Page’s fingers are incredible nimble and fly about his Danelectro effortlessly from tranquility to a storm in seconds. How Many More Times is always a highlight of a show, the band have a pretty consistent group of songs in the medley for this tour, Boogie Chillun’, Move On Down The Line, Cumberland Gap, Bottle Up and Go and The Lemon Song join The Hunter and Rosie, Plant gets a bit sexual during the Needle Blues section that gets the ladies going as well. 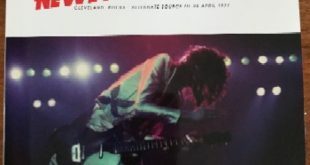 Packaging you ask, well we have a cover with a montage of photos, not sure of the date of them as I looked at the official Led Zeppelin site and there were no pictures for this date. Jimmy is wearing some pretty snazzy pink velvet pants, the inner side also features a scan of the concert ticket. Let’s not forget picture discs and numbered sticker, all the rage. Great version of this tape and a nice release from No Label.